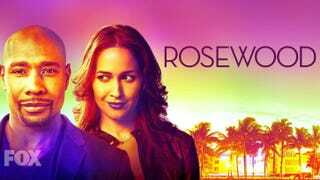 The second season of Fox's Rosewood is already underway and Rosewood (Morris Chestnut) and Villa (Jaina Lee Ortiz) are putting their skills to use in order to find out who killed her husband, Eddie. Along the way, the duo will take on cases involving college fraternities, plastic surgery, treasure hunting and Santeria. During the fourth episode, "Boatopsy & Booty,” which airs Thursday, Rosewood and Villa have a case on their hands that involves a dead body discovered by a group of booze-cruise partygoers. The case sends the duo into an aquatic world of deep-sea treasure hunting. Actress Letoya Luckett will also make a guest appearance. The episode of Rosewood airs Thursday, Oct. 13 (8-8:59 p.m. ET/PT), on Fox.